Junior School pupils at The Grammar School at Leeds (GSAL) numbered among the world’s best when they enjoyed a winning week on an online maths platform for students. Mathletics is an online learning resource that supports the curriculum, enhancing classroom learning with maths problems, games and other activities. The Hall of Fame introduces a fun element of competition, as pupils can monitor their individual and class progress, nationally or worldwide. 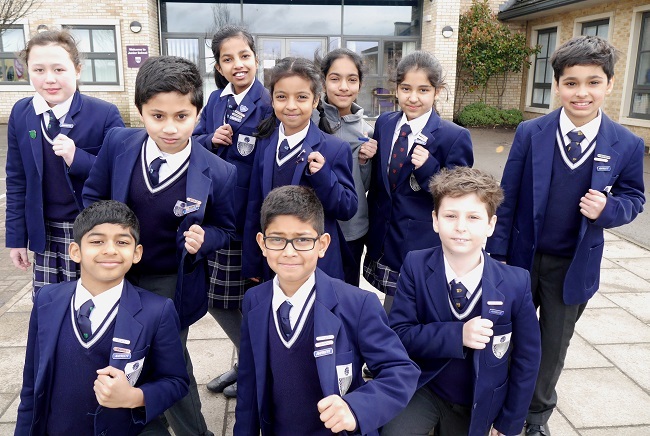 During one outstanding week last term, every single class at GSAL Junior School appeared on the UK Hall of Fame, and some even broke into the world leaderboard. This extraordinary effort by the young mathematicians had been spurred on by using Mathletics as the vehicle for the Junior School house maths competition. Jane Fisher from Mathletics came to a special assembly to highlight their achievements and present certificates and prizes. She had set the pupils three goals – everyone to achieve a certificate (which needs 1,000 points), to aim for 5,000 points and for everyone to get their class into the Hall of Fame. The top 10 scorers are pictured showing off their Mathlete badges.